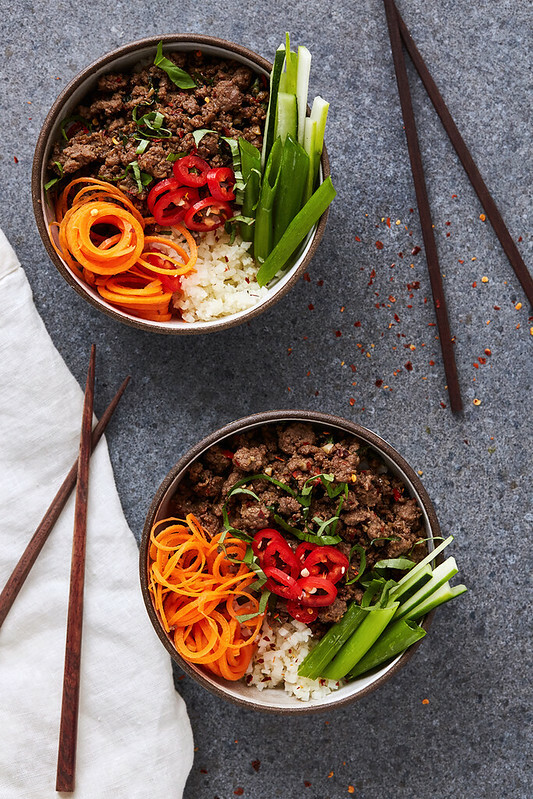 Grain-free Thai Beef Bowls. 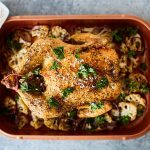 This is an easy, one-pan meal, ready in just over 15 minutes, and it’s a weeknight staple in our house. Garnish all pretty-like to create colorful masterpiece, serve over cauliflower rice or zucchini noodles or go with regular rice or noodles. 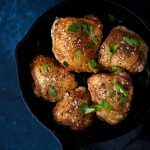 This recipe is paleo, whole30 and keto friendly. I know for many of you with families and busy schedules, though the summer is supposed to be about relaxing and chilling, somehow before you know it, the schedule fills up and you are going non-stop. Dinners are eaten on the run and you are quite literally setting up your digestion for a rough go. While it’s far easier said then done, to slow down, I think much of this action can take place with meal planning and preparing meals that can me made start to finish in under 30 minutes. Even with working from home and being a child-free family, I adore 30-minute meals on summer weeknights. Most evenings after we eat, we take advantage of the longer hours of light and we take a family walk together (hubby, myself and the pooch). If I am slaving over a big elaborate meal, if we have a sink full of dishes and a huge mess, those walks don’t happen and many nights, this is the highlight of my day. This is when Mark and I catch up on our work days, when we bounce ideas off of one another and just relish in the beauty of our neighborhood. 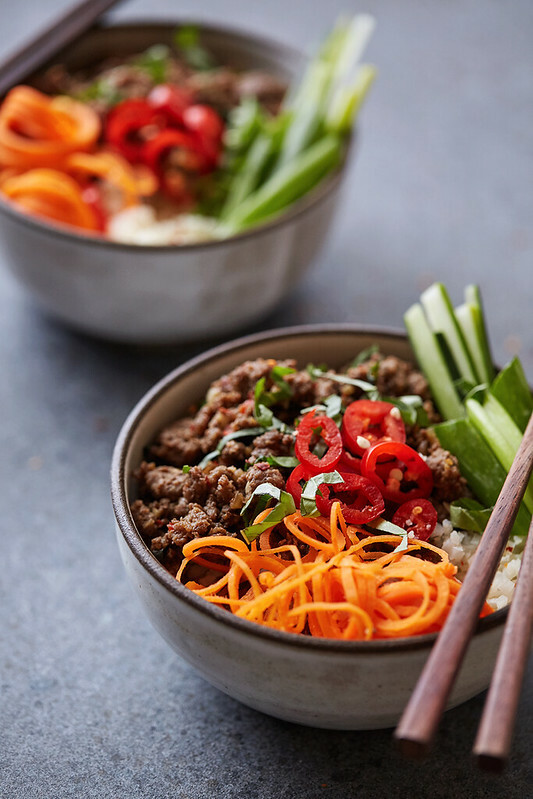 These bowls pack a punch in the flavor department and are a breeze to make, without the need for any complicated ingredients. As usual, customize this recipe how you’d like. Adjust your heat, as you prefer. 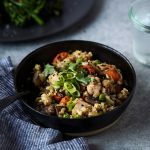 Serve over cauliflower rice, which I prefer or zucchini noodles. 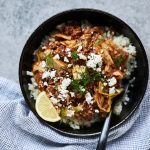 You can also serve over regular rice or rice noodles. 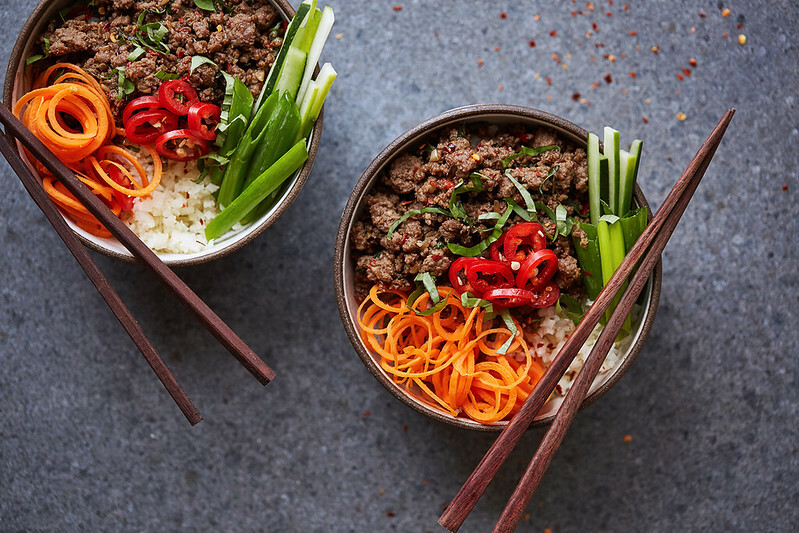 Swap ground turkey, chicken or pork for the beef, if that’s more your scene. The toppings leave some room for play, too! However you serve them up, enjoy the quick prep and cook time and the limited dishes. It doesn’t get much easier. Heat oil in a large skillet over medium-high heat. Add shallots to the hot pan, stir constantly and cook for 2-3 minutes. Then add the garlic, ginger and red chile, cook, stirring constantly, until fragrant, about 1 minute. Add ground beef and cook until browned, about 3-5 minutes, making sure to crumble the beef as it cooks; drain the excess fat. 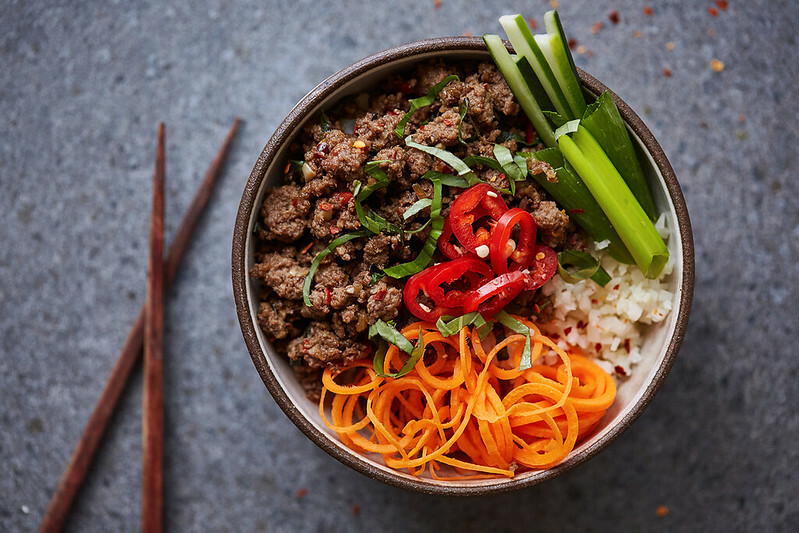 In a small bowl, whisk together the coconut aminos, fish sauce and rice wine vinegar. Add the coconut aminos sauce to the pan and stir until well combined, allowing to simmer until it reduces slightly, about 3 minutes. Turn off the heat and stir in the chopped fresh basil. 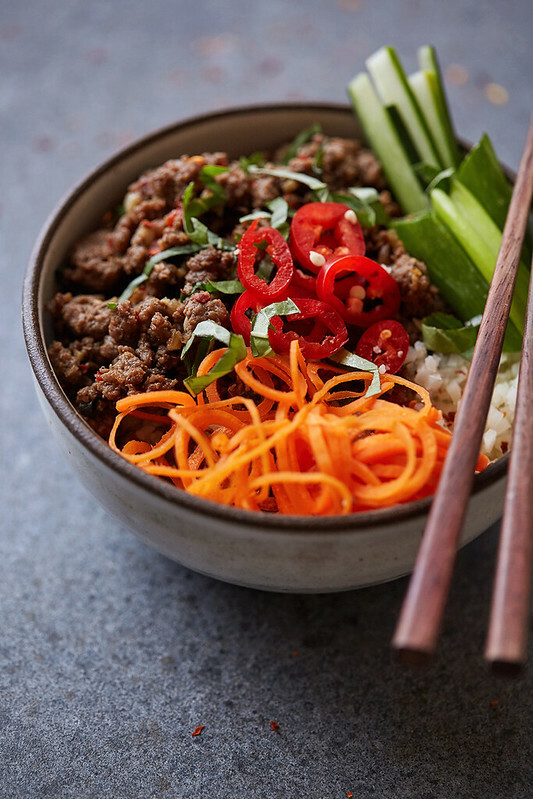 Serve immediately over cauliflower rice or zucchini noodles. Garnish with fresh carrot, cucumber, scallions, red chiles and additional fresh basil. Thanks so much, lady!! Same here, love cauli-rice! So amazing!!!!! Definitely my favorite keto dish so far. Thank you for sharing!! Had mine as a lettuce wrap. Trying to combat the constipation while on keto with more fiber. (Sorry for the TMI :P). Was delish, crunchy, and fresh with it.